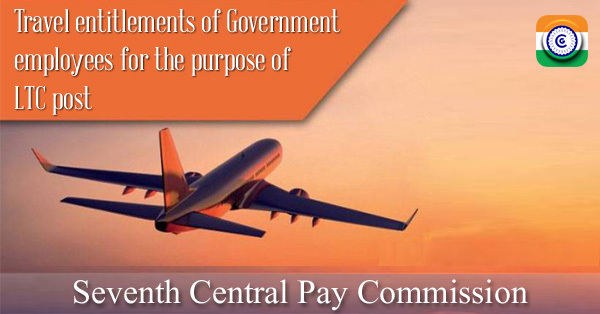 7th CPC: Travel entitlements of Government employees for the purpose of LTC post Seventh Central Pay Commission - clarification reg. Subject: Travel entitlements of Government employees for the purpose of LTC post Seventh Central Pay Commission - clarification reg. The undersigned is directed to refer to this Department's O.M.of even no. dated 19.09.2017 on the subject noted above, which inter-alia provides that the travel entitlements of Government servants for the purpose of LTC shall be the same as TA entitlements as notified vide Ministry of Finance’s O.M. dated 13.07.2017, except the air travel entitlement for Level 6 to Level 8 of the Pay Matrix, which is allowed in respect of TA only and not for LTC. 3. The matter has been examined in consultation with Department of Expenditure and it is hereby clarified that in line with DoPT's instructions dated 19.09.2017, the Government employees in the bracket of pay level 14 and above, shall be entitled for air travel in Business/Club class for the purpose of LTC. However, other conditions like rate ceiling of LTC-80 fare and booking of tickets through authorised modes, shall continue to exist.